We love pets and we love that you bring your pets with you when you come camping with us. They are part of your family which means they are part of our camping family too. There are plenty of opportunities to enjoy the campground with your dog and some things you can do to make sure your pet’s experience is a good one. Health: Make sure your dog is current with all vaccinations; particularly rabies and heartworm. It is always smart to carry their vaccination records with you as you travel. Be sure to check them regularly for ticks. Being in the great outdoors is wonderful but ticks live here too and are more than happy to hitch a ride on your pet at any opportunity. Check them for leaves, thorns, and burrs as well. These are just a few of the bonuses your pet will attract when wearing a fur coat in the woods. They will tend to get more exercise than usual which can affect their medication dosage needs. Be sure to bring enough of their meds with you for the duration of your stay. Microchipping: This isn’t required of you, it is just something we recommend to all pet owners in general. 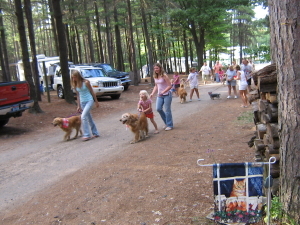 The campground will be unfamiliar to your dog, at first, and most of the people will be strangers. We know you’ll keep them on a leash but having them chipped will make it much easier to contact you if they manage to break away and run. Pet Supplies: We all have a list of necessities we need when we go camping and your pet is no different. Keeping them on a regular feeding routine with the food and treats they are used to can keep their stomachs settled and their elimination schedule predictable. Bring their favorite beds and toys so they feel at home in their new environment. Things to Watch For: Your dog will be tempted by new smells, ponds, crickets, frogs, other dogs, and the neighbor’s barbeque. It’s best to keep them on a leash to keep them out of trouble. Daily walks are enjoyable for both of you so go ahead, indulge. If curious children approach you be sure to let them know if it is ok to pet or if the dog is shy and they should stay back. Kids can sometimes intimidate dogs so help them to understand when touching your dog is not advisable. We know you and your dog will have a great time during your stay and we look forward to many return trips. If you have any questions regarding our pet amenities feel free to call us. We can’t wait to meet your fur family.